Raised in the gritty Mississippi River town of Davenport, Iowa, Cora Keck could have walked straight out of a Susan Glaspell story. When Cora was sent to Vassar College in the fall of 1884, she was a typical unmotivated, newly rich party girl. Her improbable educational opportunity at "e;the first great educational institution for womankind"e; turned into an enthralling journey of self-dis… covery as she struggled to meet the high standards in Vassar's School of Music while trying to shed her reputation as the daughter of a notorious quack and self-made millionaire: Mrs. Dr. Rebecca J. Keck, second only to Lydia Pinkham as America's most successful self-made female patent medicine entrepreneur of the time.This lively, stereotype-shattering story might have been lost, had Cora's great-granddaughter, Greta Nettleton, not decided to go through some old family trunks instead of discarding most of the contents unexamined. Inside she discovered a rich cache of Cora's college memorabilia-essential complements to her 1885 diary, which Nettleton had already begun to read. 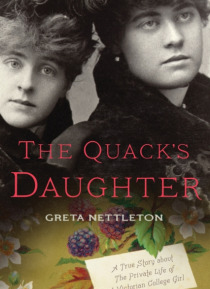 The Quack's Daughter details Cora's youthful travails and adventures during a time of great social and economic transformation. From her working-class childhood to her gilded youth and her later married life, Cora experienced triumphs and disappointments as a gifted concert pianist that the reader will recognize as tied to the limited opportunities open to women at the turn of the twentieth century, as well as to the dangerous consequences for those who challenged social norms.Set in an era of surging wealth torn by political controversy over inequality and� women's rights and widespread panic about domestic terrorists, The Quack's Daughter is illustrated with over a hundred original images and photographs that illuminate the life of a spirited and charming heroine who ultimately faced a stark life-and-death crisis that would force her to re-examine her doubts about her mother's medical integrity.